Including a fiery mage, a master of wind, and others. I could really go for a PS2-style, 3D JRPG right about now—you know, something like the Tales Of or Star Ocean series, only not as nails-on-a-chalkboard irritating as those franchises have become. 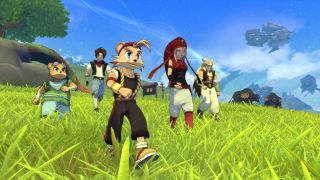 I'm hoping that Shiness: The Lightning Kingdom will be an answer of sorts: it's an old-fashioned and colourful adventure that seems a little bit Tales Of, a little bit Naruto, and that looks like it might scratch that 'light-hearted JRPG' itch that was so well-served on PS2 and PS3. We brought you the release date a couple of weeks ago (April 18! ), but if you want to get to know your rag-tag band of adventurers before then, a new trailer has arrived to do just that. Joining dogboy hero Chado is his hamster-ish engineer chum Poky, fiery mage Rosalya, a mercenary named Askel, and windypops channeller Kayenne. It's pretty damned anime, and while we don't get to know their personalities in the above video, we are afforded glimpses of their flashy combat moves. Shiness' battles take the form of real-time scraps in a 3D space that remind me of the Dragonball or Naruto titles—so if you're not a fan of dryly selecting options from a combat menu, know that the biffing in The Lightning Kingdom seems far more kinetic than in your average JRPG.